my favourite "fugitive" - BODIE 3.7 . you'll never walk alone ! I love the drama of this shot! ..And contrast between the dark figures and the foggy background. This is interesting and very, very different. I reckon it could spawn lots of stories, too. Thank you! One of my fave episodes, I like how intense Cowley looks and determined Bodie is. For this one it's all about endurance. I love the unusual composition of this shot. There's something off-kilter about it, but I'm not sure why. I love the expression on Cowley's face and the way he's wielding the gun. 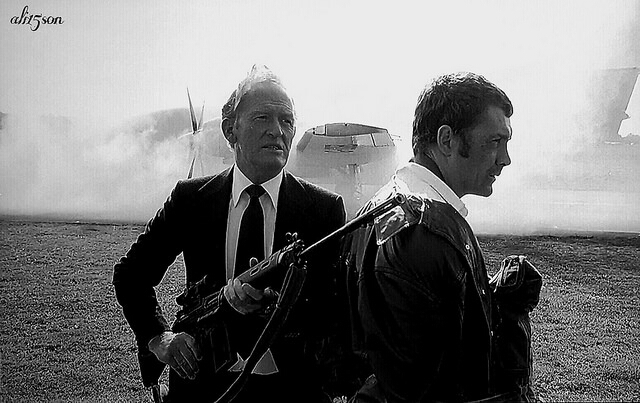 I love the smoke or haze in the background, and the expression on Bodie's face - somehow he looks much older here. A really great shot, I think. Thanks for posting it. like this and in b/w, somehow it reminds me of the end of Wild Justice.